On Friday January 28, 2011 – I arranged for a private tour and program for my graduate students, undergraduate students and alumni to see the money…at The Miami Branch of the Federal Reserve Bank of Atlanta.It is important for anyone involved in real estate to understand the role of the Federal Reserve in the regulation of monetary policy in the United States of America (the “U.S”. )Monetary policy plays a central role in real estate, especially in the availability credit which drives the market for real estate sales and development. All 35 of us walked out of the Federal Reserve with bags of money + an unforgettable learning experience!! We also left the Federal Reserve with a clear understanding of the role the Federal Reserve in relation to U.S. Monetary Policy, U.S. Banking and Real Estate. Being in a Home-Depot-sized-warehouse filled with dollar bills stacked from the floor to the ceiling was only part of the experience.Most interesting and exciting were the private lectures that I worked with the Federal Reserve to plan especially for our class and also being followed by armed guards! The highlight of the day was a private question and answer session with Mr. Juan Del Busto -the Director and Region Executive of the Federal Reserve Bank of Miami.Mr. Del Busto presented his opinions on the economy based on his over 30 year career at the Federal Reserve.Mr. Del Busto engaged us in a lively discussion and answered their questions candidly and directly. Mr. Del Busto explained that the Federal Reserve pays close attention to what is happening with businesses and industry to determine the level of flow of money in the economy. 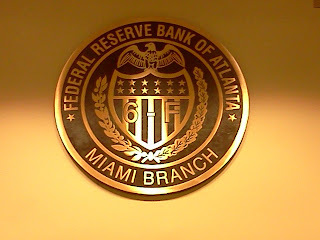 This process is formalized via an advisory board called “Branch Directors.”The members of the Branch Directors are business leaders who advise the Federal Reserve Branch in Miami of what the economic and realistic climate is like in their respective businesses such as banking, hospitality & tourism, education, agriculture/farming, and retail.Mr. Del Busto said the latest topic is the impact of the new health care law on employer’s decisions to expand their businesses by hiring new employees. Mr. Del Busto told us that we are in the midst of a changed economy and job market.He said all employees now need to work harder, seek more training and may even work two jobs until the economic crisis is stabilized. 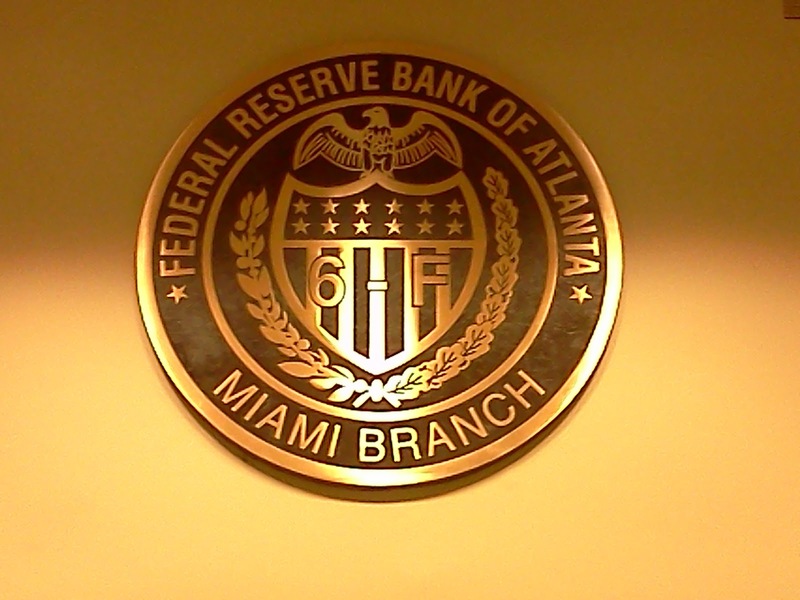 Mr. Del Busto also explained that the Miami Federal Reserve Branch is home to a large volume of check clearing because of its location physically close to the Miami International Airport.The time it takes to get to the Miami Federal Reserve from the Miami Airport is even less than the time it takes to get from the New York City airports to the Federal Reserve in New York, and for this reason many international currencies choose to fly into Miami to clear the checks faster and eliminate the float. In addition to hearing directly from Mr. Del Busto, we also learned from presentations made by Ms. Gloria Guzman, the Economics Financial Education Specialist and Ms. Ana Cruz-Taura the Regional Community Development Director. Ms. Guzman provided us with a presentation about how the Federal Reserve Bank works, what it does and its relation to monetary policy in the U.S.Ms. Cruz-Taura provided us with a presentation on Real Estate and Financial Crisis and the Impact on the Markets and Industry. This presentation led to a heated discussion about the economic downturn, credit market tigtheing, regulatory reform, capital and secondary market restructure, real estate underwriting and investment shifts and fraud in foreclosures. Ms. Cruz-Taura also pointed out that although interest rates are at their lowest ever mortgage underwriting guidelines have become more conservative and this is making it more difficult for borrowers to qualify in the current market.Both presentations generated many thoughtful questions from the students and led everyone to think more about what can be done to solve the problems of the current economic and real estate crisis, as well as to understand the responsibility that the players, the banks, the lenders, the mortgage brokers and the borrowers all bear in relation to today’s crisis. At the end of the tour no one wanted to leave, but I reminded them they had to go home and prepare their homework for me next week and with and I had to run off to my next commercial listing appointment! Kyle- I am glad that you enjoyed it and participated! 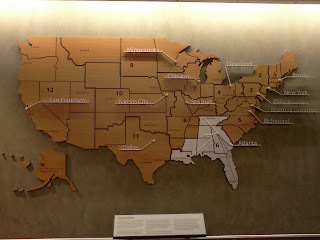 The best way to learn real estate is to apply all the knowledge that we learn in the books directly to the "real" "real estate" world…The trip to the Federal Reserve taught us the direct relationship between Monetary Policy and its impact on real estate (particularly the availability of credit – mortgage financing!) It was also fun to see all that money in one place! This was a memorable and informative event. Thank you professor real estate for including class alumni in the invitation. The tour was quite interesting and the lectures given beforehand about monetary policy and the local real estate market by Mr. Juan del Busto and Ms. Gloria Guzman (FIU alumni) were very engaging and interactive. Seeing so much currency all in one place was mind-blowing. The V.I.P. reception given to the group was very gracious. Professor Hollander really goes out of her way to involve students in relevant activities outside of the classroom, and this tour was another great event coordinated by THE professor real estate.